Circa 1858. Built in Lehigh Valley in the 1850s, this Gothic Revival mansion was the first house in the wealthy Fountain Hill neighborhood which is now the historic district in the heart of Bethlehem, Pennsylvania. 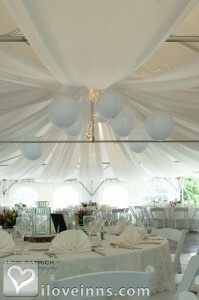 The Sayre Mansion Inn is a premier urban inn that includes two picturesque acres. Sit on the wicker-furnished Terrace or gather in the front parlor. The Asa Packer Room is ideal for meetings or private parties. 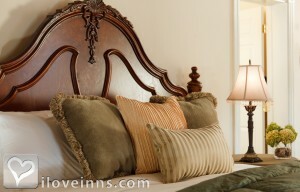 Elegant guest bedrooms and suites are inviting retreats. The Conservatory, a roof-top refuge that spans the entire top floor, has a soothing fountain and a Franklin stove fireplace. 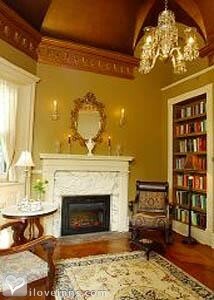 The Robert Sayre Library is a spacious two-room suite with a sitting room and marble fireplace. The elegant dining room features a breakfast buffet and choice of made-to-order entrees. Ask about romantic special packages and gift certificates. This property has 18 total guest accommodations with private bath. The types of beds available include King, Queen and Twin. Charming Property High on the hill overlooking South Side Arts District of Bethlehem. Waking distance to shops, restaurants, museums and entertainment venues. Very comfortable rooms and common areas. High Efficiency Laundry Facilities, Stringent Recycling Policies, Composting. Mature trees, in town park like setting on nearly 2 acres. Perennial floral gardens as well as potted features around the property. Cancellations and modifications must be received at least 72 hours prior to arrival date. Built in 1858 as the private home of Robert Sayre who made his fortune in the railroad and steel industries. The Mansion had several lives, serving as offices for Lehigh University, a fraternity house and finally as section 8 housing until 1992 when the property was restored to its original splendor. My partner and I stayed at the Sayre Mansion for a weekend get-away recently. We had a fantastic stay. 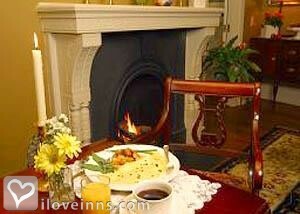 The staff was attentive, but not intrusive; breakfast was delicious; the room was pleasant and with great decore We would definitely stay at the Sayre Mansion again, particularly if we need another quiet, romantic weekend. Hello! 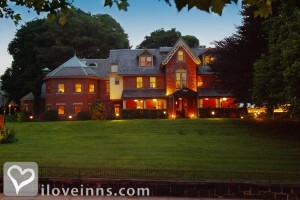 Deborah here - I just posted this review on the iloveinns.com facebook if you want to come onto it and say something about Valentines, or couples or winning the top ten. First stay at Sayre Mansion Inn and it won't be our last. Great accomodations, helpful and attentive staff, excellent breakfast, and I can't forget the homemade chocolate chip cookies. Close to center city Bethlehem and all of the attractions. Can't wait to visit again. We have been to the Sayre Mansion several times in the last few years and have had an outstanding stay every visit. We've stayed in the main house and in a carriage house suite. The rooms are lovely, with excellent attention to detail, comfort and decor. The breakfasts are truly hearty and delicious. We highly recommend. I recently had the pleasure of staying at Sayre Mansion to celebrate my 60th birthday. Everything about the Inn was top notch from the decor to the service to the delicious breakfast to the attentiveness of the staff. Carrie, the Innkeeper, couldn't have been more attentive and helpful to make our stay a truly special one. I would highly recommend a stay at the Sayre Mansion to celebrate a special occassion or just to rest and relax. I have been staying at the Sayre Mansion for at least 5 years now and I love it. I have family in the area but most of the time when I visit I stay at the Inn. The Mansion is beautiful, cozy, and convenient at the same time. They offer a full breakfast that never disappoints and the entire staff is accommodating. It's a short walk over the bridge to Main street which has lovely boutiques and restaurants. A Great weekend getaway!! I highly recommend this Inn. We stayed for one week in room #30 (The Conservatory) in the Sayre Mansion Inn. The room was spacious, open and filled with overhead light. We witnessed a thunder and lightning storm through the glass windows overhead. The room has a water fountain to dampen the sounds of local traffic. The breakfasts are fabulous and the staff is friendly, helpful and professional. We enjoyed walking the well-maintained grounds, flowers in bloom. 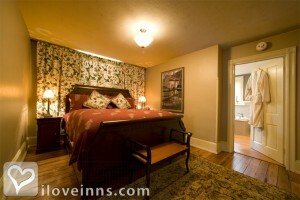 I give Sayre Mansion Inn the highest rating - this was the most enjoyable stay in a hotel ever. I selected Sayre Mansion as the place to celebrate a �special� birthday for my Mom. Mom always wanted to visit Bethlehem, PA at Christmastime having heard many wonderful things about �Christmas City� from her friends. While touring the Sayre website, an inner voice said this is the place!! As we approached the Sayre from Rt 378, the Gothic revival mansion arose on a hillside, above it the shining landmark �Star of Bethlehem�. A warm, welcoming fire burned in the parlor fireplace and we were soon greeted by the innkeeper who made us feel we�d most certainly reached a safe haven. Breakfast the next day was delicious with eggs, pancakes and every wonderful breakfast food cooked to order. There was a tray of fresh fruit and home baked pastry. Each offering was of the highest quality, carefully selected. Later, when returning from sight-seeing and shopping we were greeted by the aroma of fresh baked cookies. These were enjoyed fireside with our favorite hot beverage. 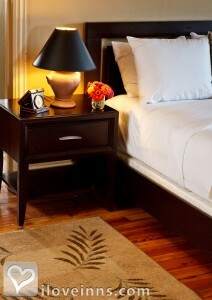 The rooms are beautifully furnished with antiques. There is great attention to detail; soaps and toiletries are top of the line and �earth-friendly�, towels are plush. Linens are luxurious, saying - sink in and enjoy a restful sleep. I sleep really well there and awake refreshed. This is important to me since Bethlehem has become our way point on a much longer journey to family for the holidays. The company of other guests adds a special dimension to our visits. 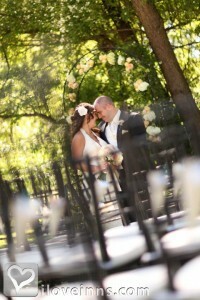 We�ve met couples and their families sharing an intimate elegant wedding. Parents visiting students at nearby Lehigh and Lafayette Universities are good company. Quite fun was a Thanksgiving weekend when alumni were attending homecoming with their young families, perhaps the next generation of Lehigh Valley scholars. When traveling with my Mom I am especially aware of the needs of senior or handicapped travelers. She stays in a first floor room just a few steps from the dining room where breakfast is served. Her room has a separate entrance leading to the car, no climbing of stairs required. 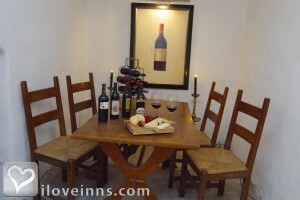 The innkeeper and staff are very attentive to her needs allowing us both to feel relaxed and comfortable. A wonderful first visit led to a new tradition. Now, we can�t imagine the holidays without our visit to the Sayre Mansion and our treasured Bethlehem friends. For the past several years, my husband and I made the Sayre Mansion Inn our home away from home as we visited our daughter and attended Lehigh University soccer games. I can honestly say that we have stayed in the majority of the rooms and have nothing but good things to say about them all. The Conservatory with its glass ceiling and light-filled space is definitely worth any trip you have to make to get to the Sayre. 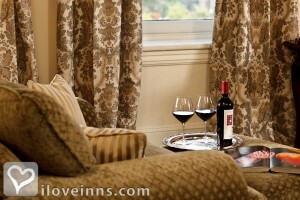 All of the suites in the Carriage House are luxurious and spacious. We had all of our extended family at the Sayre for Lehigh graduation and they all raved about it. All that being said, the greatest part of staying there is Carrie and the staff. The kindest, most helpful people you could ever meet. We will go back now to just see them! Overall it was a nice place to stay. Location was a bit confusing. Sits off a busy street. Noise from the street is loud from our room. 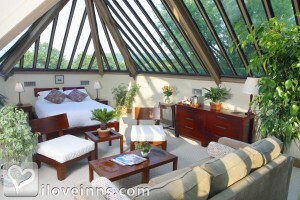 We stayed in the Conservatory room. Very nice room but didn't care to see someone else's left over food in the fridge. Water from the fountain was get all over the floor and the shower was extra small. Ton's to do in the area. Breakfast was good. I enjoyed the pastries the most. Cookies upon arrival were great also. Don't know if it was worth the amount I paid but it was a nice place and I loved that it wasn't tons of people there.